Box provides multiple levels of control that allows admins to restrict individual users in their enterprise from creating externally shared folders. This control gives IT and admins powerful, granular control over what content is shared externally or kept within the company, providing additional security. If an admin decides to restrict an individual user from adding external collaborators to their folders on Box, the restriction is placed on all content owned by that user. The setting applies to all folders they create – it does not prohibit the user from inviting external collaborators to non-restricted folders owned by other users. Where is the feature found and how can it be applied? In Admin Console, click Users & Groups. In the Edit User Access permissions section, check Restrict external collaboration. The setting can also be enabled as a default for all new users added to the enterprise from that day forward (note that it cannot be applied retrospectively to all existing users). What does the user see when an admin enables this setting? When the restriction is enabled for a user, the folder properties for any folders they own have the Restrict collaboration to within <company domain> check box enabled, with no way for them to disable it. 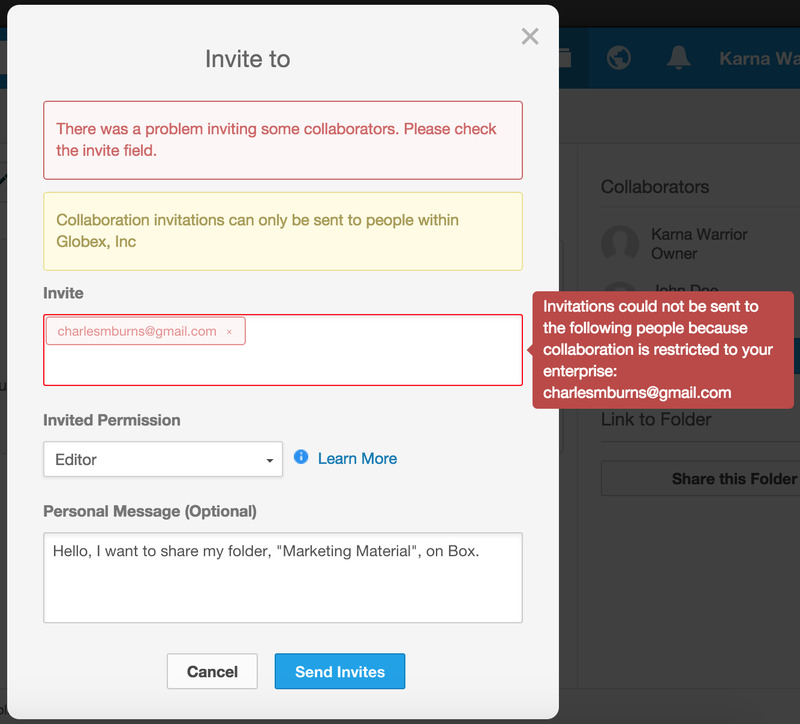 If the user tries to add an external collaborator to a folder they own, those users are displayed in red in the invite box and the user sees a message informing them that invites are restricted to within their company. Before you press send, you should also see a pop-up window about the restriction. When an admin adds the restriction for a user, does it automatically remove existing external collaborators from folders they own? After the restriction is placed on a user, existing external collaborators in folders that user owns will not be removed automatically. To remove existing external collaborators from restricted folders, the admin can navigate to Users > External Users > Right click on an External User > Remove User from All Items. You can also remove users from individual folders by clicking their name, locating the folder in the folder access section and choosing the "Remove" access level. Does the external collaborator admin control also affect shared links? No, shared links will not be affected – a user with the restriction enabled will still be able to share content externally with shared links. The restriction only affects their ability to invite an external collaborator to folders they own.